LDS Bookstore has everything you need to make studying your scriptures an enriching and faith-building experience. We offer all of the standard works, separately and in combination. This includes both the triple combination and quad combination scripture sets. We also carry economy-sized scriptures and Spanish scriptures. 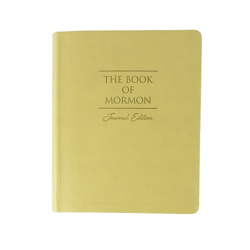 Additionally, LDS Bookstore is pleased to provide name embossing in a variety of attractive fonts. To encourage people of all ages to gain more insight during study, we provide numerous scripture accessories and reference materials, including pencils, highlighters, stickers, bookmarks, and scripture mastery cards. Scriptures and scripture accessories make great gifts for missionaries, seminary graduates, and recent converts. Whether you would like to purchase a set of scriptures for someone else or for yourself, LDS Bookstore hopes to make finding the right set of scriptures a positive experience.